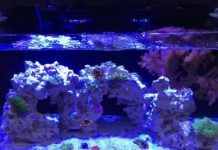 Sea anemones are never far from the mind of many mini-reef or marine aquarists. 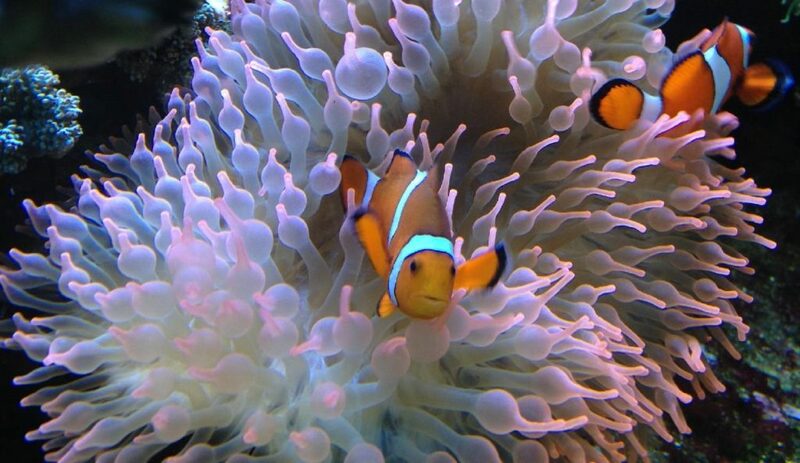 First, the sea anemone-clownfish mutualism is one of the enduring icons of the hobby, and second, some anemones, such as species of Aiptasia, are among the more serious pests that can be found in our systems. But what are sea anemones? In this article we discuss sea anemone structure and how it functions. All sea anemones are polyps and are placed in the class Anthozoa of the phylum Cnidaria. 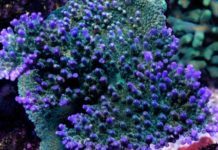 There are basically three different types of anemones that are intentionally kept by aquarists: Pacific host anemones, Caribbean Condylactis anemones and various corallimorph anemones, also called “mushroom” polyps (so named by somebody who was fond of eating magic mushrooms, I think). A few other anemone types are occasionally intentionally kept, but they are decidedly rarer. Unlike the other cnidarians, all anthozoans are polyps — there is no alternate jellyfish or medusa life stage found in this class. The basic cnidarian animal is simply a bag with tentacles and a mouth at one end. The mesoglea is thick and fibrous in most sea anemones, and forms a rugged and durable sheet of proteinaceous material that both the gastrodermis and epidermis are attached to. The interior of the bag is the gut, also known by the jargon terms of the coelenteron or gastrovascular cavity. Gut works equally well and is a lot easier to type, so I will use it here. Although the cnidarian body plan is conceptually simple, natural selection has acted to change it significantly. In sea anemones, for example, the gut is about as complicated as a basic bag can get. Instead of having a simple hole opening to the inside, the inner edges of the mouth continue internally as a tubular projection called the pharynx. Sheets of tissue or septa extend out from the body wall, and many of these fasten to the pharynx. These septa divide the gut into a great many compartments and increase the surface area of the gut by many times. The numbers of these septa are manifested on the surface of the animals by tentacles. The septa define a tentacle, and the septal walls are continuous with the sides of the tentacle at its base. The number of tentacles basically equals the number of septa. Now, because each bump on the surface of mushroom polyps or carpet anemones is a tentacle, you can see that there are a lot of septa, and a lot of septal compartments to the gut. Although the upper limit of septa is almost limitless, there are no fewer than eight septa found in the most primitive of anemones. Many of the simpler anemones have their tentacles arranged in multiples of six, which is supposed to be a characteristic of the sea anemones and stony corals. 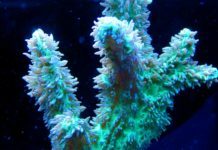 Thus, they are sometimes put into a group referred to as the hexacorallia, as opposed to the soft-corals, which always have eight tentacles and are referred to as the octocorallia. However, I really don’t think anybody has tried to count the tentacles of a carpet anemone to verify this. Continuing with the inside story, the center edges of the septa, below the level of the pharynx, are often elaborated out into long internal strands or tentacles called septal filaments. These are often heavily laden with nematocysts or stinging capsules, and some people think they may be used to finish killing any ingested prey. I think any aquarist who has watched a carpet anemone eat a fish will doubt this explanation. In these cases, as with most prey, the fish are killed within seconds of tentacular contact from the venom in the stinging capsules or nematocysts. There is a coiled thread extending into the cavity of this capsule. When stimulated, the nematocyst lid opens and the thread is blown out with explosive force, penetrating the prey. There are about 30 different types of nematocysts, and some of them have hollow threads that allow the contents of the capsule to exit through them and enter the prey. They can also contain simple threads or glues to entangle and immobilize prey. The capsular contents can, however, be venoms of significant toxicity (Hesslinger and Lenhoff 1988, Kozloff 1990, Ruppert and Barnes 1994, Russell and Watson 1995, Thorington and Hesslinger 1996). Additionally, they are often specific to the type of prey, so that if the anemone eats fish, its nematocyst venom is specific to vertebrates and won’t necessarily affect shrimps or squids. Such vertebrate-specific venom will, however, affect aquarists. One of the largest Northeastern Pacific sea anemones is Urticina piscivora. As the name indicates, it normally eats fish. Some years ago I knew about a guy who managed to, through some events best not discussed (why would anyone kiss an anemone? ), touch a tentacle tip to his lips. Six weeks later, the spreading, ulcerated sore resulting from that contact had covered much of his lower lip. He eventually recovered, but decided that graduate school in the marine sciences was not for him. 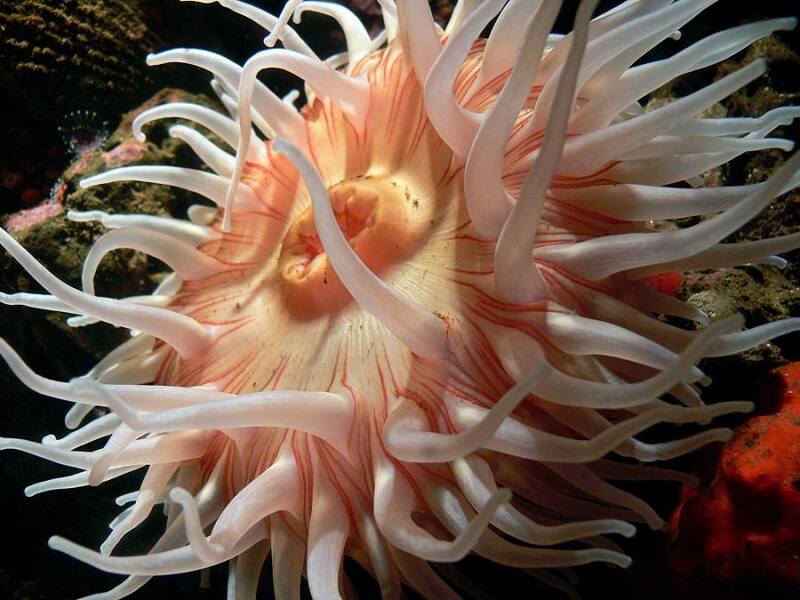 Normally, anemones kill their prey by using tentacular nematocysts. The septal filament nematocysts appear to have another function. The threads discharged by these nematocysts most likely hold the septal filament edges tightly to the prey, creating small volumes where enzymes secreted by nearby cells could be confined for the beginning of the digestion of the prey. Although digestion is initiated in the gut, small fragments of the prey are ingested by the cells of the gastrodermis, and much of the digestion occurs in those cells. Cnidarians lack true muscle cells, but many of the cells of the epidermis and gastrodermis contain contractile filaments. These cells are referred to as myo-epithelial cells. 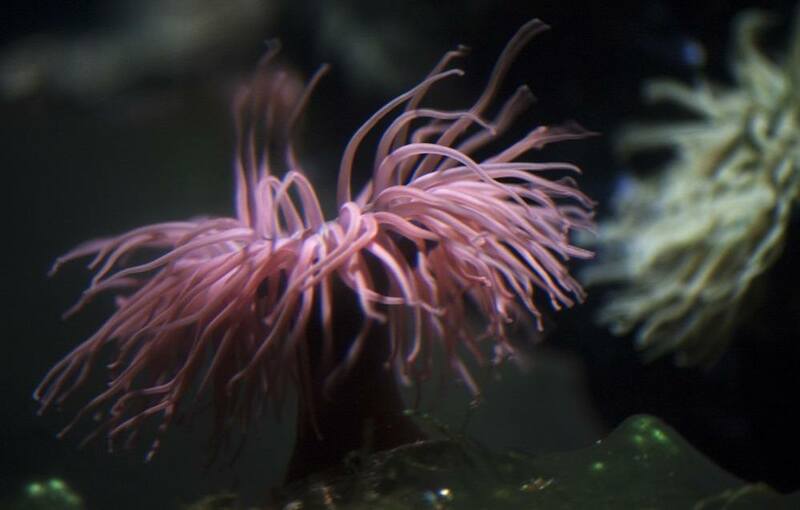 In sea anemones, the contractile elements can occupy much of the cell, and these cells approach the capabilities of true muscles in their abilities. 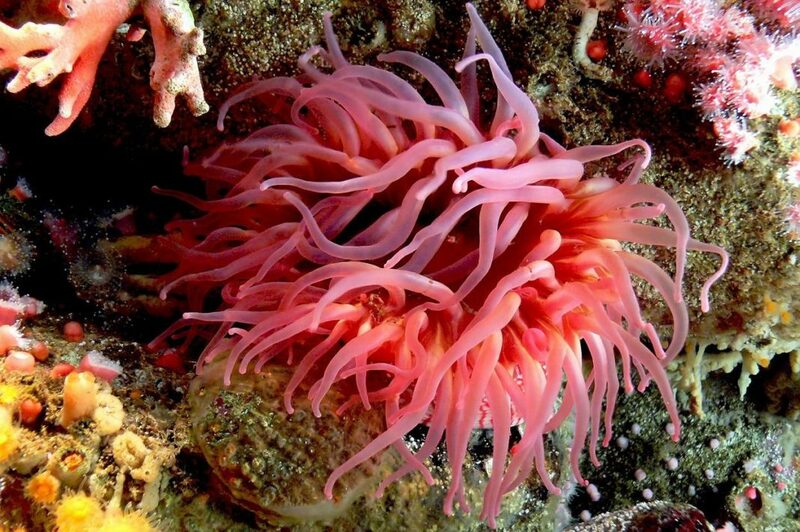 The “muscle” bands found in some of the sea anemones are capable of impressive contractions. There are muscles running from the bottom of the animal to the top, along many of the septa that function to shorten the animal. Under extreme conditions they can flatten even the largest sea anemone into a thin pancake of tissue. Additional strong muscles are found in bands around the base of the column, and as a sphincter around the mouth. Other smaller bands of contractile tissues are found on the tentacles and along the sides of the column. Sea anemones are generally covered in cilia — small (really small, about 0.1 by 2 micrometers [0.000004 by 0.00008 inch]), beating, hairlike cellular projections. Cilia cover the animal internally and externally. On the outside they generate small currents that move tiny particles off the animal. In the gut the cilia circulate fluid through the gut. Sea anemones have one or two densely ciliated tracts called siphon glyphs that generally run from the outside to the inside, down the corners of the mouth. These tracts pump water into the animal, replenishing the water in the animal so that the contents don’t become stagnant. Also, because muscles can only contract, if the animal has been completely contracted, ciliary currents are the only way fluid can get into the animal to re-inflate it. It can take a large sea anemone over 24 hours to become fully inflated. Another characteristic of anemones is the presence of an adhesive pedal disk that they use to move along over the substrate by means of muscular contraction and ciliary action. The disk also secretes mucus that helps the animal adhere to the substrate. Sexes are generally separate in sea anemones, but some species may be serial hermaphrodites, functioning as males during one spawning and females at a later time. The typical reproductive pattern is that both sexes spawn into the water, where fertilization occurs. Within a few days of fertilization, a swimming motile larva called a planula is formed. Depending on the species, the larva may or may not feed. Eventually, the larvae will metamorphose into small sea anemones and take up existence in the benthic environment. Some sea anemones brood their young internally or protect them externally after some amount of development, so even in these primitive animals, parental care is found. Asexual reproduction is common in some sea anemones, but it is hard to make generalizations about it because many appear to lack this capability. Some can reproduce by splitting in two (binary fission), and others will leave little pieces of the pedal disk behind as they move (pedal laceration). These pieces can differentiate into small sea anemones. Some, such as the anemone pest Aiptasia, can produce buds that are small versions of the adult. These are released and crawl or drift away. Aiptasia can also generate asexually produced larvae that can disperse over long distances. In summary, these are some of the basic morphological properties of sea anemones. 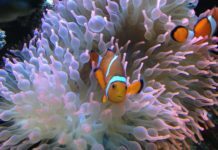 In a subsequent column, I will discuss some aspects of the care and maintenance of specific anemones found in marine aquaria. Baumann, D. Localization of digestion activities in the sea anemone Haliplanella luciae. Biol Bull 189:236-237. Hesslinger, D. A. and H. M. Lenhoff, eds. 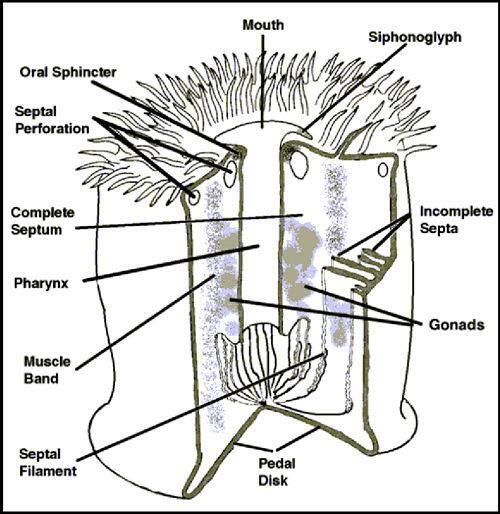 The Biology Of Nematocysts. Academic Press. San Diego. Pp. 600. Koehl, M. A. R. Mechanical design in sea anemones. In: Coelenterate Ecology And Biology. G. O. Mackie, ed. Pp. 23-31. Kozloff, E. N. Invertebrates. Saunders College Publ. Philadelphia, PA. Pp. 866.